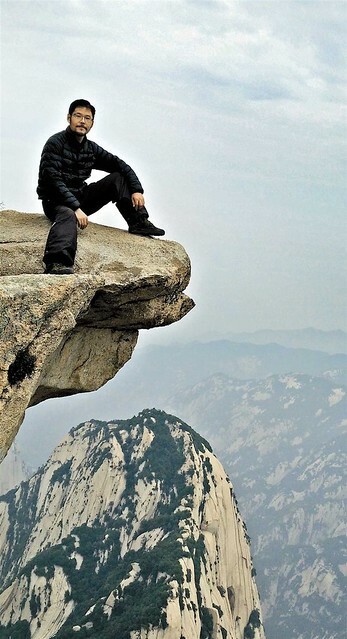 One of the Five Great Mountains of China,* Huashan, or Mount Hua, has historically been known as a place of retreat for Buddhist hermits and contemplatives from China’s other spiritual traditions, partly due to its relative inaccessibility and the precipitous nature of many of the climbs and narrow trails—indeed, the route up the mountain, which negotiates sheer cliffs and plunging ravines, has been described as one of the world’s most dangerous hikes. This may go some way to explaining the draw the fabled mountain holds for Shandong-born artist Tian Xuesen, who has devoted himself to painting the majestic vistas of Huashan, and immersing himself in the mountain’s silent solitude. For more than seven years, Tian has painted nothing but Huashan, reveling in capturing the shifting colors, shapes, and moods of the moutainscape through the changing seasons and the shifting light between dawn and dusk. Tian still return to the city from time to time, when necessary, to put his work up for exhibition. But he notes that the urban wilderness makes him uncomfortable, and time spent in tortuous traffic jams leaves him feeling dislocated. Afterwards, he always returns to Huashan.